A lot of people think budgeting requires lot of work where one should keep track of all their expenditure. Different people use different tools like writing them down in a notebook, excel, using special apps on their smartphones. But none of those things work, as it is human nature to get bored and stop tracking each of your expenses after a week or so. Also what is the use of knowing how much that dinner in the fancy restaurant for your anniversary cost last week? You wanted to spend that money for your special day and it doesn’t matter if it costs a few hundred rupees extra. Knowing your spending history is useless, except if you can use that information to correct your expenses in the future. But who are we kidding here? Its hard work and we will never do it. Instead, there is a better approach to budgeting your money – allocating the money you spend for the entire month before you begin spending. Best part is, to start doing this, you don’t have to use any complex software and everything can be automated through your online banking account. Most of us have a fixed salary per month and need to keep all our expenses within the limits of the salary for the 30 days. The way one can start doing this budgeting is categorise your expenses, savings, investments into different categories. This doesn’t mean 20 micro categories like rent, food, groceries, TV, mobile, internet, etc. All you need to start today is have three very broad categories. This is your everyday expenses without which it would be very hard to live your usual life like house rent/housing loan EMI, food, groceries, phone/internet bills, transport, medical expenses, etc. If you see the list of things I mentioned, you can see that I mentioned house rent or housing loan EMI. Many people can’t get their mind around thinking about repaying their housing loan as a expense. They think of that as an investment. If you bought an apartment for living instead of renting a house and you are still repaying the loan every month, it is an expense. Instead of paying monthly rents, you are paying your bank monthly EMI. So, just add that as an expense under “Needs”. Typically your rent or EMI would take up the most of your expenses. Some of these expenses might be recurring every month like rent, phone bills, etc., while some might not be. For example, the birthday party you need to throw, gifts you need to buy for a wedding, insurance premiums, property/water tax on your house, etc. Sit down and calculate your fixed expenses and remember this number as it will help you to quickly calculate your “Needs” account. Once you have your fixed expenses, at the start of every month try to guesstimate your variable expenses – gifts, party, taxes, scheduled car service, etc. Add these two numbers together and your got your “Needs” account for the current month. This is the money that you definitely need this month for your living expenses. Remember to not spend this for anything else than your needs. You can have this money in your salary account or savings bank account and as you keep encountering these expenses you could just use this money without having to worry. But you might ask what if I over spend it to buy a phone? You cannot overspend anything more than this as we will transfer all the remaining money to the other two accounts “Wants” and “Investments” automatically before you even get to spend anything else. This category is very important and make sure you don’t miss this. This includes all your savings and long term investments that you need for your retirement, children’s education, etc. There are various investment products that give excellent returns much more than your typical savings account. Make sure your 80C tax benefits are also covered in this – any money you put in your PPF, ELSS tax schemes, tax saving FDs, etc. Your insurance premium wouldn’t come under “Investments” account as I am sure you would have taken a Term Insurance for better cover and so it would categorised under your “Needs” account. Most investment options has the facility to automatically debit the money from your savings account. If you have invested in mutual funds (ELSS or even plain equity), they have the option to setup SIP (Systematic Investment Plan) which takes money out of your account on a specified date and invests in the instrument. You need to decide on how much you want invest every month and then setup your automatic transfers. If you are salaried and get paid on the last date of every month, try to setup your auto debit dates before 5th of the current month. Anything more than 5 days, you will be tempted to use that money for something else. This category is for buying all the things that you think are nice to have but aren’t very important to buy immediately. Example: the all new iPhone/iPad, your annual vacation trip, downpayment for your car, that fancy expensive dress you think would be nice to have for your friend’s wedding, etc. Some of the items in your “Wants” are cheap and can be bought immediately from your salary – expensive dresses, nice shoes/bags, etc. But some other items like the car, latest smartphone, foreign vacation might require some planning. It is not easy to pay for it from a single month’s salary, but you can save a part of your salary every month and over a year you would have collected a nice sum. There is an bank instrument which can help you save a fixed amount every month for a certain time period – called Recurring Deposit(RD). You decide on how many months you want to save your money and how much you can put in every month. Every month your bank automatically transfers money from your savings account to your recurring deposit account. You also get interest for the number of days you are invested. For example: If I know I want to buy a smartphone (apprx Rs.50000) in a year, I would open a RD for 1 year with a monthly deposit of Rs.4000 only. In a year I would get back Rs. 50,319 at 8.75% interest rate. Check out a very simple RD Calculator from HDFC Bank. Set such an account for every big ticket items you want to buy. But buying simple items like dresses (even though you got enough dresses for your office), surprise gifts to your spouse, etc., it doesn’t make sense to start a separate RD account. You can keep the remaining money (Salary – Needs – Investments) in your savings account itself and spend it whenever you want. Since you have automated almost 90% of your expenses and investments you can now spend this extra money for whatever you want however you like. If you are afraid that you might over-spend this extra money, you can create a separate savings account on a different bank and setup automatic transfer to this account. Since your Needs money and Wants money is now lying in two separate accounts, you can control your expenditure easily. What percentage to split it up? Now you might be confused over how much the split should be across these three categories. You can sit down with a calculator and accurately measure your needs, investments and wants to the penny and decide it, but that is hard work and we never would end up setting this up. 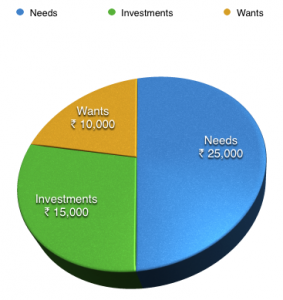 Instead I would suggest a split like 50-30-20 – 50% for needs, 30% for investments, 20% for wants. Try this out for a month and manually transfer the money to various accounts and see if you can lead a comfortable life. If you can, good. If you can’t try changing the percentages a bit and do it the next month. After 2-3 months you will be able to accurately guess your optimum split and then you can setup the automatic transfers and don’t have to worry at all (at least till your next pay raise). If my salary is Rs.50,000, I would make sure all automatic debits are done by 5th of every month. My salary account would have my needs money to spend on food, clothing, groceries, etc. Wants account would have my money for buying gadgets, vacation, etc. Investments would be in equity mutual funds or PPF or FDs all automated. The important part of making this work is to set things up so that all your money goes to the respective account automatically. This makes sure that you can’t accidentally take out money which is meant for your retirement investments and use it for buying your smartphone. Freeing up things for your mind, helps you avoid making complex decisions related to money everyday. Less decisions means lesser mistakes on your investments or expenses. Once you begin this, you can go into the finer details of the different micro categories like what percentage of your investments should be in equity vs debt. Remember 80% of the benefits can be obtained by doing 20% of the work. Do this 20% work organising your salary today and you can reap the benefits of your investments and savings for many years to come.